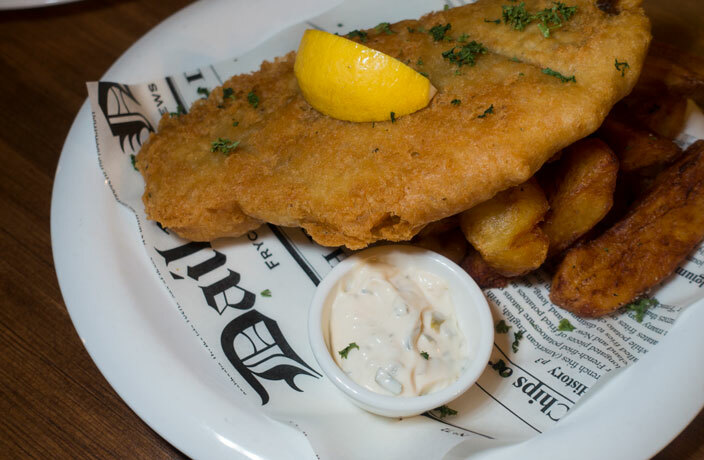 While fish and chips grace the menus of many fine establishments in Shanghai, few are solely devoted to the beloved British staple. Remedying that situation is Fish+, brought to you by Harry Belford Spencer (aka Mr Harry) and his partners. After relocating the Nanjing Xi Lu location of his namesake British-themed restaurant to Jinshan, Mr Harry returned to a short-lived spot on Yan’an Xi Lu. He has since taken over a space in front of Jing’an dive bar BnC (formerly the home of Detroit BBQ), and edited down the menu transforming it into Fish+. Fish and chips are the cornerstone of Fish+. A vegetarian version featuring a battered soy-based meat substitute is also available. Good quality Icelandic cod is dipped in a feather-light batter before being deep fried, resulting in a delicately browned exterior encasing steamy flakes of fish. Our only regret is the cavernous space between the batter and the fillet. As for sauces (one included, RMB6 per additional), the zesty tartar and classic mushy peas both score high marks. We do have to point out that we’d rather have malt vinegar than the white variety provided. You can order the Fish with Triple-fried Chips (RMB88/reg, RMB108/large) or Fries (RMB78/98). From hand-cutting to cooking, it takes a full hour to produce the twin pleasures of crisp salty goodness and velvety softness in every single chip. On a slightly lighter note, Grilled King Prawns with Fries, Salad and Garlic Bread (RMB78/108) also makes for a decent plate of food. Side salads are often an afterthought, but here radish and walnuts are nice additions for both heft and crunch. Situated in what basically amounts to the front area of a friendly neighborhood dive bar, this is a simple joint utterly devoid of pretension. What it does have is a heavy dose of British kitsch from the iconic red British phone booth motif at the entrance to the hodgepodge of ceramic knickknacks (the Queen has her own shelf). The food and service are still a work in progress, but they’ve started smoking and curing their own bacon for fry-ups, which gives us hope for a British-style brunch situation very soon. They will also be playing most major (English) football games on the projection screen, so keep that in mind when choosing your next viewing location. Have you been to Fish+? Post your review here for a chance to win a Saucepan voucher. A quirky café gives way to technicolor Yunnan reveries. AB InBev takes Boxing Cat back to the future. This refined robata-ya puts premium Ingredients on fire. The complete Nordic dining and socializing experience in Xintiandi Plaza. Surf and turf with a from-scratch ethos out in Pudong's Century Link Tower. Head over to Julu 758 for simply comforting Taiwanese eats.